Articolo per TimeOut Istanbul, in inglese; ma ho già parlato della mostra sull’arte di guarire nell’antica Bisanzio al museo di Pera nel blog, in italiano. Seeking a miracle? You don’t need to go to Lourdes or Medjugorje, Istanbul is the perfect place – since the Byzantine era, when it was called Constantinople – to pray the Virgin Mary, drink holy water and be healed by divine intervention. Still today, Christians and even Muslims flock to the numerous hagiasmata/ayazma in use (“holy springs”, in Greek and Turkish) to perform old rituals and express wishes, or to thank saints for their intercession. The two most ancient, popular, and reputedly effective are those of Zoodochos Pege (or Balıklı) just outside the Roman walls at Silivrikapı, and of Blachernae in Ayvansaray along the Golden Horn. They figure prominently in the new exhibition organised to celebrate the 10th anniversary of the Pera Musuem: “Life is Short, Art Long”, devoted to medical and magical healing in Byzantium. We had chance to preview it guided by its curator Brigitte Pitarakis, an Istanbulite who teaches in Paris. “The main aim of the exhibition – she told Time Out – is to put objects, images and places in context, to make sense of them. Their are part of our shared cultural heritage, people should know them better”. It is small and fascinating, full of treasures – rarely seen – on loan from museums and libraries in Greece, France, and Great Britain, but also from the Greek Patriarchate in Istanbul; its title comes from an aphorism of Hippocrates of Kos, the first true doctor in history: medicine is an art (techne), but a lifetime would not be enough to achieve perfection. However, the art of healing in Byzantium was practised not only by physicians – men as well as women, as the funerary stele of Amazone displayed clearly attests (V century a. C.) – but also by priests, saints, and magicians. In fact, people could go through a very complicated process which involved in turn herbal potions and magical cures, consulting doctors and spending some time in the urban hospitals of Constantinople (associated with monasteries), pilgrimages to holy shrines possessing relics of saints, miraculous icons, and sacred springs. In some sanctuaries, supplicants were supposedly cured in their dreams by Christian saints, who just kept alive the earlier tradition of the Pagan semi-god Asclepius; in some others, water was poured over the sick with buckets and pitchers, or was rubbed on the affected part of their body. Physicians themselves sometimes prescribed amulets when their skills alone failed to provide relief to a patient. The exhibition shows through icons, reliquaries, amulets, medical equipment, and manuscripts how medicine and magic interacted, never completely opposite but often complementary: Byzantine doctors constantly appealed to supernatural powers, illness was in some occasions described as “a demonic invasion”, medical treatments could be followed even by exorcism. 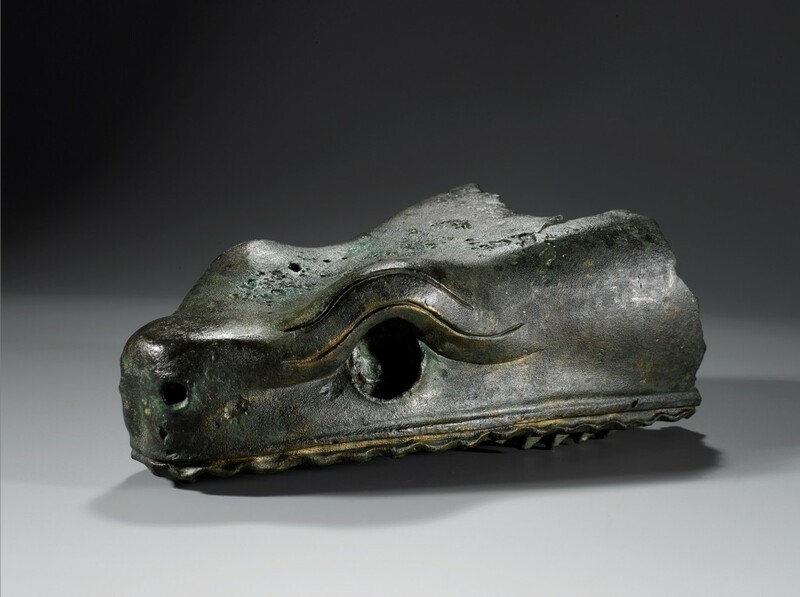 The first remarkable object one comes across is the well known serpent head in bronze from the Hippodrome, originally in Delphi and used as a fountain; the snake represented eternity and wisdom before Christianity, but became a symbol of the Devil afterwards whilst at the same time keeping strong apotropaic virtues (against evil influences). Doctor saints, Panteleemon and the brothers Kosmas and Damian, are depicted in some precious icons from Kastoria, surgical instruments in their hands; they perfectly embody the contiguity between rational medicine and divine healing, since even during their lives they performed both operations and miracles. The section on “Demons, symbols and the cosmos” presents a rich variety of amulets and rings, used by magicians and doctors alike against demons and negative influences from the stars and the planets; while two neck collars in silver dating from the XIX century were used to bound the mentally ill – believed to be possessed by demons – in the churches of healing saints, hoping for a supernatural remedy. A video reconstruction in 3D of some of the most famous of the hagiasmata, fountains, and cisterns of Constantinople – “Wondrous Waters” – makes that world alive again. The section on the practice of rational medicine is more modest in scope and less endowed with artifacts but still exhibits a few gems, such as the illuminated manuscript of the Works of Hippocrates – the basis of antique medicine – now at the Bibliothèque nationale de France but commissioned in the XIV century by the Byzantine general Alexios Apokaukos (next to the book are featured some marble capitals from his funerary monument in Selymbria/Silivri). Of great interest are also the botanical specimens collected in Anatolia by John Sibthorp, professor at Oxford University in the XVIII century: among which the hallucinogenic mandragora officinarum (or mandrake), also used in magic rituals. “Life is Short, Art Long” will stay open until the 26th of April; on the 14th of March – in Turkey, a special day dedicated to doctors – an international symposium will discuss some of the themes exposed in the exhibition and the catalogue.